3. End the warfare state. The goal of current negotiations must be to cut poverty rather than cut poverty-related spending, according to the letter from Hoshibata and Winkler. "Sacrificing access to health and food security at the altar of 'deficit reduction' is profoundly unjust," they write. "A moral budget agreement would strengthen programs that ensure a basic level of economic security for the most vulnerable among us." The social justice agency also issued an "action alert" urging United Methodists to contact their members of Congress in support a moral budget. You can access the action alert at "A Faithful Alternative to the Fiscal Cliff." The letter from Hoshibata and Winkler is below. As you continue efforts to resolve the budget impasse, the General Board of Church & Society of The United Methodist Church urges you to reorder our nation’s fiscal and budget policy to reflect our shared concern for those living in poverty and all those struggling on the economic margins. The real crisis in the United States and around the world is not the so-called “fiscal cliff,” but rather the continued manipulation of God’s economy of abundance into a world where the wants of the few have taken priority over the needs of the many. A moral budget and economy would prioritize the needs of the poor, require more from the wealthiest among us and value true human security over a perpetual warfare state. As a faith community, The United Methodist Church is committed to ministry with all those whose lives have been shattered by policies that value the rich over the poor and individualism over community. The goal of current negotiations must be to cut poverty rather than cut poverty-related spending. Programs designed to ensure basic human needs in the United States and around the world must be shielded from further cuts and any agreement must stimulate meaningful employment opportunities for all who seek them rather than threatening an already fragile economy with austerity measures. A moral budget would be focused on creating an economy of shared prosperity where all can find meaningful work and live lives of dignity free from hunger and poverty. 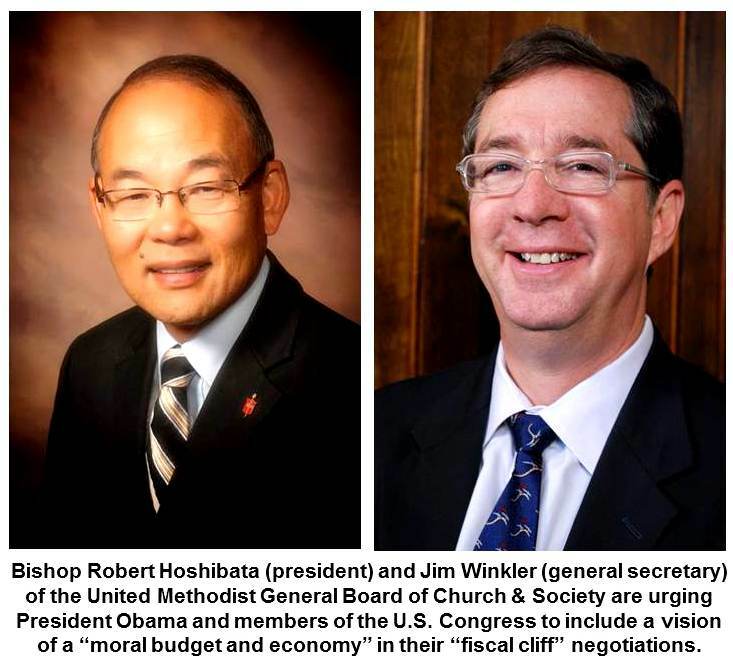 The United Methodist Church states clearly: “We support measures that would reduce the concentration of wealth in the hands of the few [and] support efforts to revise tax structures and to eliminate governmental support programs that now benefit the wealthy at the expense of other persons” (Social Principles, ¶163 The Economic Community). We therefore believe that the United States’ tax system must remain progressive in its demands on those who have benefited from our economy and raise sufficient revenue to meet both current and future needs. Among the main drivers of our recent deficits are the temporary, surplus-era tax cuts whose benefits flowed disproportionately to the wealthiest among us. To tell a senior living on the cusp of poverty, or a hungry family, or a poor child needing medical care that they must "sacrifice" and live with even less in order to continue these policies is a challenge to the conscience of those of us who take seriously the Gospel message of mercy and justice. Our faith tradition calls us to be peacemakers and encourages us to “beat swords into plowshares.” So, too, a moral budget would prioritize true human security over the perpetual warfare state. To this end we urge you to maintain the scheduled cuts to military spending and resist those who would fund war at the expense of human needs. We are particularly concerned that international poverty-related development assistance is at risk. As members of a global church we speak on behalf and alongside our brothers and sisters around the world in asking that this assistance be protected from further cuts. Some also have suggested changes to mandatory programs such as Medicare, Medicaid, Social Security and Supplemental Nutrition Assistance Program (SNAP). While we affirm efforts designed to strengthen the sustainability of these programs and protect the beneficiaries they serve, we find it deeply troubling that some are considering cuts only with an eye towards deficit reduction. Sacrificing access to health and food security at the altar of “deficit reduction” is profoundly unjust. A moral budget agreement would strengthen programs that ensure a basic level of economic security for the most vulnerable among us. As people of faith we are committed to intergenerational justice and we agree that we must not burden our children and grandchildren with an unsustainable debt. But we further believe that we owe it to our children to expand economic opportunities and address systematic economic injustices. Current negotiations provide the opportunity for our elected officials to demonstrate true leadership — leadership that addresses the injustices of today’s economy and reorients our fiscal policy towards a vision of shared prosperity where all of our brothers and sisters have opportunities that afford them lives of dignity free from hunger, disease, and poverty. That is the vision we share as a people of faith and a vision we believe should guide your negotiations in the days and weeks ahead.